More aid workers are being targeted in violent attacks than ever before, but the roots of humanitarian insecurity have nuanced and surprising causes. Syria. Afghanistan. Mali. Central African Republic. Today’s complex conflicts seem to be defined by insurgents, terrorist groups and other violent actors with ideologies that increasingly disregard the rules of war. Over 150,000 people died in conflicts around the world last year, with a further 59 million displaced – the highest total ever recorded. Troublingly, aid worker attacks have increased in tandem. Headlines relay stories of humanitarian aid workers caught in the middle, killed either in the fog of war – or worse, targeted for their very efforts to help the neediest. In 2013, 474 aid workers were attacked – the most violent year ever. While attacks are up, things may not be quite as dire as feared. As the aid sector has grown exponentially over the past two decades, so has the number of aid workers. Global humanitarian aid spending has increased over 400% since 2000, to $25 billion USD today, with the number of international aid workers tripling over the same period. When accounting for this increase, per capita figures are in fact stable – or even show a slightly downward trend. While more attacks are occurring, the risk of attack does not appear on the rise. Yet any increase is too much, and both scholars and practitioners have increasingly sought to understand where, why, and how aid workers become targets of violent attacks. This is especially relevant as humanitarian aid organizations push to work more extensively in remote field settings, do more sophisticated work, and undertake a much wider variety of development and peacebuilding tasks than just a decade ago. With this in mind, we examined data on aid worker deaths, violent conflict, and security and development indicators to assess the conditions underlying aid worker attacks. We tested over one dozen factors, including the nature of conflicts that humanitarian agencies operate within; the structure of humanitarian operations; political and institutional dynamics; and economic conditions that may motivate attacks. Perhaps most obviously, we find that aid workers are much more likely to be attacked in countries experiencing conflict than those at peace. We also find that more violent conflicts see a greater number of aid worker attacks. An increase from a medium intensity conflict, with around 400 deaths per year, to a high intensity conflict, around 2000 deaths a year, roughly doubles the expected number of aid worker attacks – from around 20 attacks to more than 40 attacks per year. For aid organizations the lesson here is clear: conflicts increase risks for field staff; and the more intense the conflict, the more attacks are to be expected. Unfortunately, these are often precisely the conflicts where aid workers are most needed. Though some have suggested that general insecurity increases risk to humanitarian staff, we find no evidence that insecurity or criminal violence are related to the number of aid worker attacks. Attacks do not appear to be influenced by national homicide rates, a measure that captures the generalized level of insecurity and violence, the relative presence of criminal groups and other ‘everyday’ threats to humanitarian workers. Instead, countries with high homicide rates see just as many aid worker attacks as those with low rates. This could be good news for aid organizations, meaning that countries that have high levels of homicides and generalized violence are no riskier for humanitarians; or that additional agency precautions when deploying to these countries have been effective. 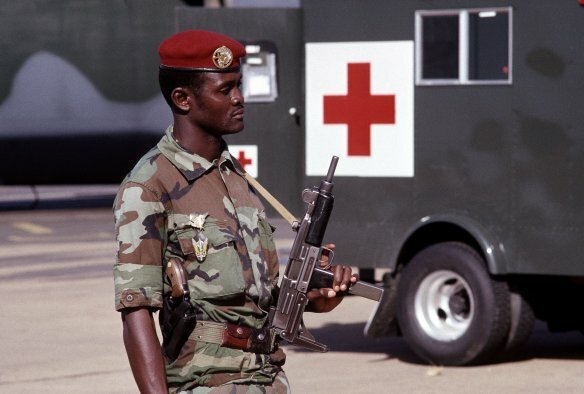 Contrary to the common assumption that military presence of great powers increases the incentives for insurgents to attack humanitarian workers, we find no effect of a NATO presence on attacks on aid workers. Areas where NATO deploys forces see just as many (or as few) attacks on aid workers as where NATO is not present. While not significant, if anything our results tend to indicate that countries with NATO forces see fewer attacks on aid workers. We do find, however that countries with UN peacekeeping operations (PKO) deployed see more attacks against aid workers – and that this risk increases as UN forces get larger. However, the type of PKO mandate seems to be important. PKOs with traditional mandates (i.e. observing the terms of truce or peace agreements, or policing buffer zone) are associated with more attacks on aid workers. Conversely, PKOs with transformational mandates (i.e. reform of police, army, judicial system, elections) see no increased risk, supporting research suggesting only PKOs with transformational mandates effectively reduce conflict. While risks to aid workers have been linked to broader issues of civilian protection, we found no evidence indicating that conflicts involving the active targeting of civilians by either governments or insurgents see higher rates of attacks on aid workers. This is heartening, as periods of one-sided violence are situations where civilian populations are especially vulnerable and need aid the most, and may encourage the international community to provide more extensive support for vulnerable populations. In general, we find that more developed countries (as measured in terms of GDP per capita) see fewer aid worker attacks. Similarly, more democratic countries see fewer attacks than autocratic countries, while ‘transitional democracies’ – often those with greater risk of political and criminal violence – are no more dangerous for aid workers than full democracies. This same pattern holds for other measures of political risk, state capacity and state consolidation. In general, economic development and political consolidation are associated with lower levels of risk to aid workers. These five factors show not only the value in challenging conventional wisdoms about aid worker attacks, but also how we can better understand where aid workers are most at risk. As aid agencies continue to expand across the globe – and to new areas of conflict and insecurity, such as in urban settings – the evolving and contested role of humanitarian space both within and across countries is of high priority for further study. And by further refining our understanding of the conditions for violence against humanitarians, aid organizations of all types can better prepare for and prevent aid worker attacks. Jason Miklian, Håvard Mokleiv Nygård and Kristian Hoelscher are Senior Researchers at the Peace Research Institute Oslo (PRIO). Although i like the article in general, i find it a bit exaggerated to say that Aid workers are more vulnerable in a setting with PKO. I reckon its on the contrary having served in a few PKO and Humanitarian operations globally. Yes, definitely the TCC could provide more proactive and robust support by its troops in PKO ops. What you state may certainly be correct in various circumstances. Our research for a global sample between 1997 and 2014, however, suggests that where UNPKOs are present, or have greater budgets, aid workers experience more attacks. This initial finding is, as you suggest, somewhat counter-intuitive, and warrants further attention. Could you please reference what you describe as “research suggesting only PKOs with transformational mandates effectively reduce conflict” and how this conflict reduction and/or research is linked to the security of humanitarian actors? Our general thought is that if UNPKOs in general are effectively able to reduce conflict in a society it will be all else equal be safer for humanitarian workers. Thanks for the feedback however your “general thought” does not take into account issues of perception for humanitarian organizations caused by PKOs in conflict zones. PKOs with multidimensional mandates can increase insecurity for humanitarian organizations. Planning papers of UN Missions sometimes admit this. To make a claim to the contrary without backing as you do is misleading and unfortunate.